Now that I am a rapidly-graying adult humanoid, I still find myself scanning and memorzing names, dates, places—skills that would have probably made me a pretty good gum-cracking girl reporter. Unfortunately, I'm more Langley Collier than Nancy Drew. As you might then imagine, we were ecstatic when given a copy of the Acid Archives, the poorly-designed yet mind-blowing tome you see pictured above. Put together by the good folks over at Lysergia, this book compiles some of the most chromosomally-damaged psych and weirdrock ever cut to wax. Of course, we here at The Little Black Egg are so broke that actually purchasing any of the rarities contained between the covers of this here book—well, that's out of the question for the time being. Thankfully, some of stuff has been or is being reissued. I spent an enjoyable weekend with my pal Matty, the kind benefactor who set me up with this stunning title, listening to some of the luminaries described therein.
. . . you could write a whole book about the strange cerebral buttons this album pushes, the aggregated effect of which is truly staggering. The female vocalist is unsure of things such as rhythm and accents, and opts for a very unusual half-sung/half-spoken syle that sounds liek a 1950s housewife humming to herself at K-Mart. The male vocalist has a flat, geeky voice that lends little weight to the apocalyptic and often quite bizarre lyrics about degereate hippies, drugs, Sodom & Gomorrah, immoral adults, sinners and more . . . I've since heard the New Creation, and lemme tell you—that description? Spot on. 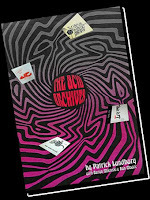 For the serious to super-serious psych collector, well, it seems like this guide is kind of required reading. For a cash-strapped jerk like myself, flipping through this guide is like reading about strange, half-forgotten crypto-zoological menageries. Either way, the authors deserve a thundering round of applause for the work they've put into this title.